from the places where their religion was born. questions from the civilised global society. pilgrimage by the citizens of their enemy country? just 3 Kms from border. Why this discrimination? 6. Govt of India grants from the state exchequer Rs. 25000 per head on pilgrimage to Kailash Mansarovar. reluctance of 57 years to Nankana from Amritsar. Instead of subsiding the fair the Govt is charging Rs. conducted when the citizen had applied for a passport? of any country to Bodh Gaya. Why? the peoples beliefs matter a lot. 13. Can we keep the Hindus away from the pious Ganga? in the railway tracks at New Delhi railway Station. altered but not our beliefs and traditions? in the case of Sheikh Brahm. journey of just 3 kms in Pakistan territory. where the Kashmiris are fighting for their freedom. Are we not a secular country? through and something need to be done. 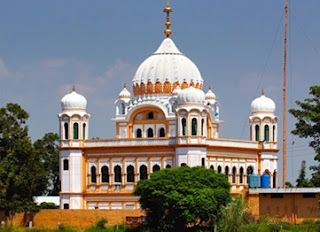 Pakistani Sikh shrines now, on humanitarian grounds. humble appeals to Govt of India and Pakistan.